After adjusting for other factors that could influence BP such as age, gender, BMI, smoking status, salt, alcohol, exercise and coffee, the researchers found that midday sleepers had 5% lower average 24 hour ambulatory systolic BP (6 mmHg) compared to patients who did not sleep at all midday. 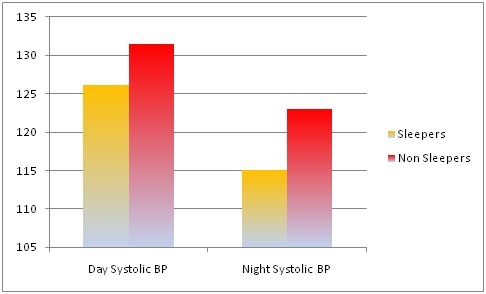 Their average systolic BP readings were 4% lower when they were awake (5 mmHg) and 6% lower while they slept at night (7 mmHg) than non-midday sleepers (Figure 1). The researchers also found that in midday sleepers pulse wave velocity levels were 11% lower and left atrium diameter was 5% smaller. “These findings suggest that midday sleepers have less damage from high blood pressure in their arteries and heart,” said Dr Kallistratos. The duration of midday sleep was associated with the burden of arterial hypertension. Patients who slept for 60 minutes midday had 4 mmHg lower average 24 hour systolic BP readings and a 2% higher dipping status5 compared to patients who did not sleep midday. Dippers had an average of 17 minutes more midday sleep than non-dippers. 2Pulse wave velocity indicates arterial stiffness, which is a measure of the detrimental effects of hypertension and ageing in the arteries. 3Left atrial size is a marker of deleterious heart adaptation to increased BP levels and a predictor of adverse events. 4The bigger number of the two in the blood pressure (BP) measurement is the systolic BP and the lower number is diastolic BP. 5Dipping status refers to the percentage of blood pressure drop during sleep at night. For background information, please contact the ESC Press Office.